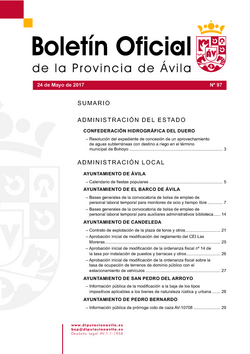 INFORMACIÓN DE CONSTITUCIÓN DE NUEVO COTO DE CAZA DEL TÉRMINO MUNICIPAL DE CASAS DEL PUERTO. RESOLUCIÓN DEL EXPEDIENTE DE CONCESIÓN DE UN APROVECHAMIENTO DE AGUAS SUBTERRÁNEAS CON DESTINO A RIEGO EN EL TÉRMINO MUNICIPAL DE BOHOYO. APROBACIÓN INICIAL DE LA ORDENANZA FISCAL SOBRE LA TASA DE OCUPACIÓN DE TERRENOS DE DOMINIO PÚBLICO CON EL ESTACIONAMIENTO DE VEHÍCULOS. APROBACIÓN INICIAL DE MODIFICACIÓN DE LA ORDENANZA FISCAL Nº 14 DE LA TASA POR INSTALACIÓN DE PUESTOS Y BARRACAS Y OTROS. APROBACIÓN INICIAL DE MODIFICACIÓN DEL REGLAMENTO DEL CEI LAS MORERAS. CONTRATO DE EXPLOTACIÓN DE LA PLAZA DE TOROS Y OTROS. INFORMACIÓN PÚBLICA DE PRÓRROGA COTO DE CAZA AV-10708. INFORMACIÓN PÚBLICA DE LA MODIFICACIÓN A LA BAJA DE LOS TIPOS IMPOSITIVOS APLICABLES A LOS BIENES DE NATURALEZA RÚSTICA Y URBANA.